Modern yoga, that is, the form practiced daily by tens of millions of people around the world, goes back directly to Lord Shiva according to Indian tradition. At the same time, however, modern yoga originated in the early 20th century, a creation of Indian savant T. Krishnamacharya, a story that is far less known and is where Breath of the Gods looks to explore further. We see Krishnamacharya’s life and teachings through director Jan Schmidt-Garre’s eyes on his search for authentic yoga. His journey leads him from the legendary students and relatives of Krishnamacharya’s to the source of modern yoga, at the palace of the Maharaja of Mysore. He discovers the different styles and teaching methods of the yoga masters; from Pattabhi Jois he learns the ‘Sun salutation’, from Iyengar the ‘King of Asanas’, the headstand, and finally Sribhashyam reveals to him his father’s secret ‘Life Saving Yoga Session’. 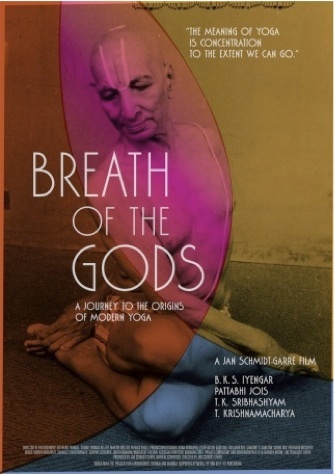 Breath of the Gods is an eye-opening journey to the origins of modern yoga, featuring interviews with yoga legends B.K.S Iyengar, Pattabhi Jois, and T. K. Sribhashyam, and rare historical footage. If you go to see it, let us know what you think about it!